Professor Arie Kacowicz, expert on Latin America, believes that despite Netanyahu's successful visit, Brazil will continue to be neutral. Professor Arie Kacowicz, an expert on Latin America from the Department of International Relations at the Hebrew University of Jerusalem, predicted on Wednesday in an interview with Arutz Sheva that, despite the encouraging statements of Brazilian President Jair Bolsonaro, the Brazilian embassy will not move to Jerusalem. 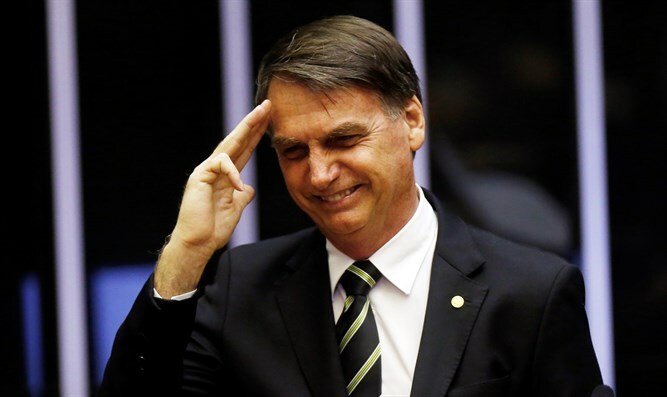 While Israel has welcomed the move, Arab leaders have condemned it and have pressured Bolsonaro not to go through with it. "In my estimation, out of familiarity with Brazil's foreign policy, it will not happen so quickly," Kacowicz said. "Brazil has a special relationship with all the countries, including the Arab states and Iran, and it is unlikely that President Bolsonaro will rush to transfer the embassy. Brazil was one of the first countries in Latin America to recognize a Palestinian state and have good relations with the Palestinians as well as with us," he added. Professor Kacowicz explained the importance of the relations between Israel and Brazil, saying, “First of all, in the economic aspect Israel has a $1 billion free trade agreement. There is also cooperation on technological issues. Israel will sell them technological equipment and UAVs. In the international aspect, there are 50 million Evangelical Christians in Brazil who support the Israeli government, and this is also reflected in their support for their condemnation of Hamas in the UN. There is no doubt that the prime minister is opening new avenues here."